July 4 is a pretty big day for patriotism, parades and, yes, hot dogs. All across the country, people are grilling them, boiling them -- even scarfing them down in competitive eating contests. But what, exactly, makes a hot dog a hot dog? California legislators are seeking to define it. To see how that idea is playing in the field, I headed over to Dave’s Dogs, a cart that's a couple blocks from the state Capitol in Sacramento. "But what’s below all those toppings? The Legislature, via a bill that passed the Assembly earlier this year and is now in a Senate committee, has a pretty specific definition: “a whole, cured, cooked sausage that is skinless or stuffed in casing, that may be known as a frankfurter, frank, furter, wiener, red hot, Vienna, bologna, garlic bologna, or knockwurst, and that may be served in a bun or roll." To be fair, the hot dog definition is just three lines in the midst of a larger omnibus bill filled with relatively minor technical changes to California’s food codes. A group representing local health inspectors, the California Conference of Directors of Environmental Health, is pushing for the definition. The whole point, they say, is to define hot dogs as precooked or cured so that street vendors who reheat them are held to different health standards than restaurants. “We have been finding that local jurisdictions have somewhat confused the issue,” explained CCDEH executive director Justin Malan. “If true hot dogs are fully cooked or cured, they can be reheated or cooked on those rollers.” Raw sausages like bratwurst, on the other hand, would still be held to a higher sanitary standard. Malan conceded “there’s some sort of joking around the issue,” but said the hot dog definition would move California toward a national model for health code standards. Sean Foley wasn’t quite sure how to define a hot dog. “A hot dog to me is not a sausage, but an Oscar-Meyer-wiener-type of thing. 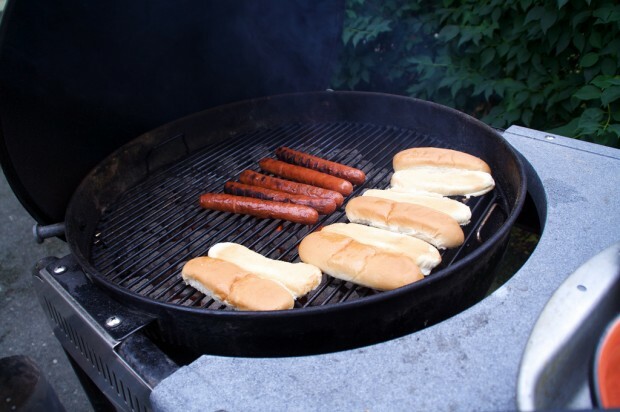 That’s always been a hot dog to me.” As for the nine other names in the Assembly definition? “If a hot dog is encompassing that, that, to me, is morphing on the name,” he said. Amy Frey thought it over, and said nobody ever asks her for anything but a "hot dog." “None of the above,” she said. “But I did have a guy who used to drive by and yell, ‘Hi, Weenie Lady!’ at me."